You probably remember us announcing a large SHAPE event last month – we boasted that, this June, a special showcase will be organized at the 17th edition of MUTEK Canada. Now we’re coming back to you with pleasant news – indeed, no less than 10 SHAPE acts will be performing at the festival, and the first nine of them have been confirmed. MUTEK, one of North America’s largest festivals for electronic music and digital arts, has announced the second wave of artists of its upcoming edition, and this announcement highlights the collaboration with SHAPE, naming the first 9 acts that represent our platform and, in a wider sense, the current experimental and avant-garde electronic music and art scenes of Europe. Seven of these acts come from the 2016 roster of SHAPE artists. Swedish electronic producer Peder Mannerfelt, also known as The Subliminal Kid and one half of analog electronics duo Roll the Dice, introduces us to his range of groove-conscious minimal techno, precise cinematic compositions and exploratory sound. 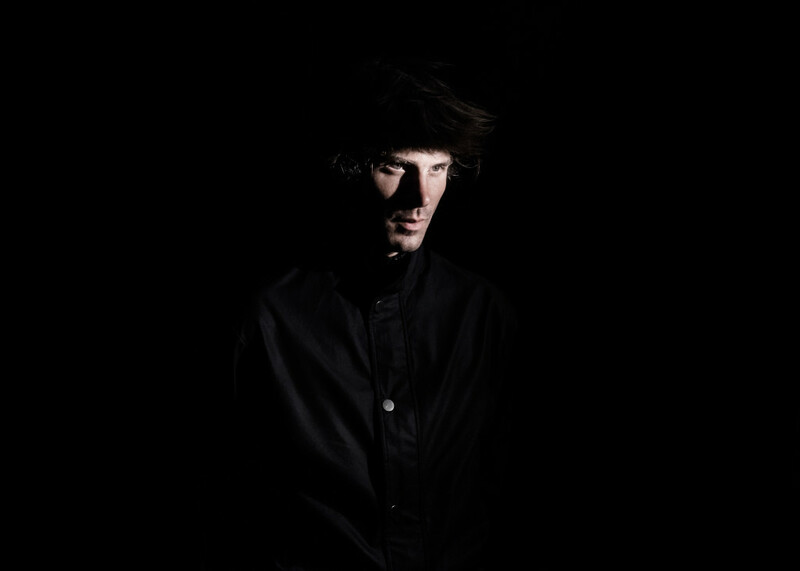 Brussels-based Belgian producer Laurent Baudoux, also known as Sun OK Papi K.O. and in Electrosold Collectif (with Mouse on Mars’ Jan St. Werner) comes to MUTEK as Lawrence Le Doux, playing his wobbly deep and tech house styles on Sunday night. Paris-based producer and Warp Records artist Jackson shows us what his tailor made instruments can do in experimental sound and light performance, Light Metal Music. 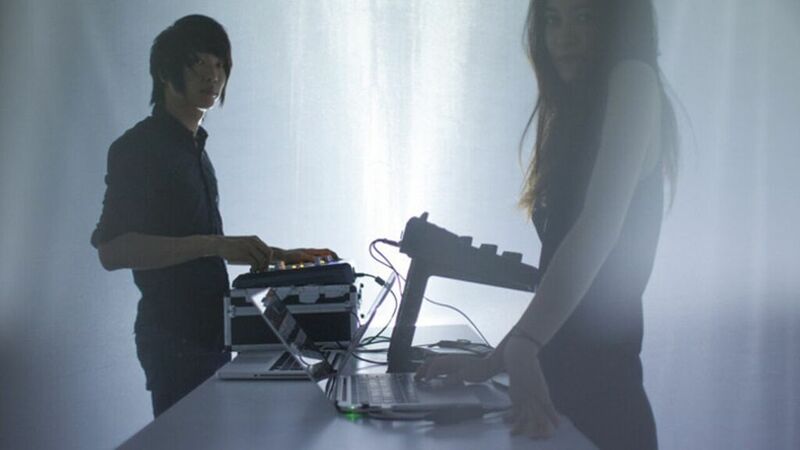 French-Japanese duo Nonotak return to the festival with Shiro, a four screen audiovisual performance of experimental techno meshed with interplaying shadow and light. Prague-based Mexican producer, musician and multimedia artist Laura Luna experiments in emotive minimalist compositions where lo fi meets high tech electro. Polish group T’ien Lai, led by Jakub Ziołek, mixes live percussion, electronics and a chaos of musical styles into a controlled rhythmic entity. Finally, Spatial is an electronic musician and multimedia artist from London exploring low frequency vibration with physical intervention through DJ sets & live performance and via recorded media. Two SHAPE alumni have also been confirmed for the showcase: the Italian producer, musician and composer Lorenzo Senni, who deconstructs trance into abstract compositional electro and experimental, fractured sound, and Swiss-born Nepalese-Indian artist Aïsha Devi, who takes pages from Bangladeshi poetry, physics and bass music to make provocative metaphysical intercultural dance music. 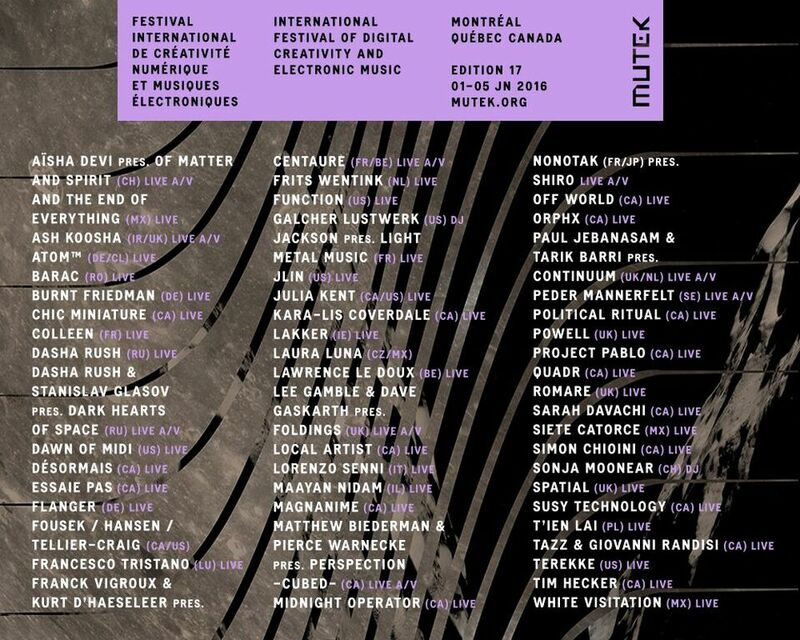 MUTEK 2016 will happen at the Musée d’art contemporain de Montréal (MAC), as well as at several other select venues in the downtown Montréal area, 1 – 5 June. The SHAPE platform is supported by the Creative Europe programme of the European Union.